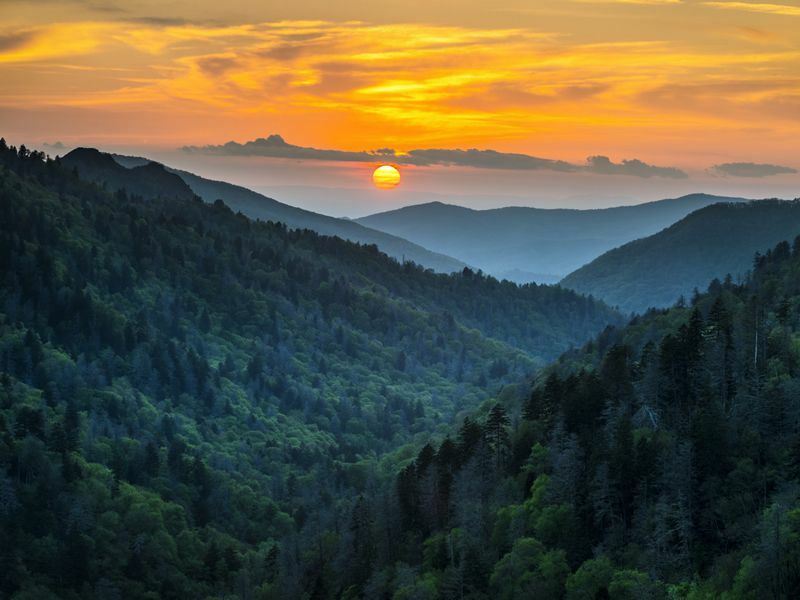 Why visit Great Smoky Mountains? Incorporating over 500,000 acres of UNESCO World Heritage natural beauty, criss-crossed with trekking trails, fast-flowing rivers and those all-important mountain vistas, the Great Smokies are a wildlife enthusiasts dream destination and a 'must hike' if you're visiting North Carolina or Tennessee. Below are our top 10 things to do in the Great Smoky Mountains - activities to whet your outdoor appetite and if you've got plans to spend some time in and around the Great Smoky Mountains then prepare yourself for an experience that will promise to be as exciting as it will be reflective. Chimney Tops Picnic Area is recommended to the entire family. This cosy picnic area is very large, can accommodate many and used to be a campground until the National Park Service converted it to picnics only. Other picnic areas are located at Big Creek, Cades Cove, Collins Creek, Cosby, Deep Creek, Greenbrier, Heintooga, Look Rock, Metcalf Bottoms, and Twin Creeks - a number of these remain open year-round. Picnic pavilions are available for group usage at a charge. Even if you've never even touched a rod before or threaded a hook, there's no better time to try the sport of fly-fishing than the streams and rivers of the Great Smoky Mountains National Park. All manner of trout (rainbow, brown and Appalachian brook) can be found darting amongst the smooth rocks of the river bed and as the trout catching season is pretty much all year round then there's never a bad time to get involved. To be fair, even if you don't manage to hook anything, the peace and tranquillity of a day spent knee deep in water is pretty much as good as it gets and you can always stop off for a fish supper once the day is done. From the Native Americans to the early settlers from across the Pond, the Great Smokies have provided dwellings for numerous pockets of life and undertaking a history tour of the park will no doubt bring you closer to the people who have lived here since prehistoric times. Rugged, resourceful and independent best describes most of the former inhabitants of the Great Smoky Mountains National Park and following in their footsteps will enable you to observe the log buildings and once thriving community sites that are still in evidence to this day. What with all that higher elevation and propensity for rainfall, the Great Smoky Mountains are well-known for their fast-flowing rivers and if you've ever fancied seeing the river bank from a slightly wetter perspective then there's only one way to do it and that's on top of an inflatable raft. This is a really exhilarating outdoor activity and needs to be tried at least once in a lifetime and especially in an environment as rich in natural beauty as the Great Smokies. Get kitted out in helmet and buoyancy aid, hold your paddles aloft and grab hold of the sides as this is going to be a wild ride that you'll remember for the rest of your life. Thanks to the open landscapes that are common to Caves Cove this is one of the best locations in the whole of the Smoky Mountains to observe wildlife in their natural environment. Aside from the animal attractions, this area has long been inhabited by people and it won't take long until you're immersed in the preserved homesteads and churches that remain in evidence to this day. Registered as a National Historic District and featuring numerous examples of life in early pioneering times, a trip to Cades Cove will take you back in time and may even surprise you by being one of the highlights of any trip to the Great Smoky Mountains. Practically every waterway in the Great Smokies manages to fit in at least one cascading section along the way and if you've got plans to incorporate a few waterfalls into a hike or scenic drive then you certainly won't have to worry about options. Thanks to more than adequate rainfall and the higher elevation, the Great Smoky Mountain's rivers and streams are blessed with some sublime features with the likes of: Grotto Falls, Laurel Falls, Rainbow Falls and Ramsey Cascades all doing their level best to ensure you find the perfect place to cool off on the trail. From wild flowers to wild animals, heading out on a guided nature trail whilst visiting the realms of the Great Smoky Mountains is certainly something to be considered if you're passionate about nature. As the foliage within the park is so dense it's definitely advisable to follow an experienced tracker or ranger however, in you fancy your chances, the likes of Cades Cove and Cataloochee are pretty much thought of as the best areas to spot wildlife due to their naturally open environment. Black bears, bob-tail deer, raccoons, wild turkeys and blankets of wild flowers in the spring time mean that remembering to pack your binoculars and camera should be at the top of your list. As the highest point in both Tennessee and on the Appalachian Trail, no visit to the Great Smokies NP is complete without featuring the fir-covered peak of Clingman's Dome which lies at an elevation of some 6,000 odd feet. If you're not able or willing to make the AT section that incorporates the Dome then it's pretty straight forward to gain access by car via Newfound Gap whereupon you can park up at the designated area at Forney Ridge. A short paved walk will take you to the very top of the mountain and the views from the observation tower are more than worth the effort no matter how you care to travel. Featuring the highest peak on the Appalachian Trail is just one of the Great Smoky Mountain's claims to fame and anyone who has read the Bill Bryson book 'A Walk in the Woods' will already know just how hard this stretch of the trail can be. If you plan to approach at either the Davenport Gap (north) or the Fontana Dam (south) with ideals of conquering the 71 mile trek you'll need to give around a week's worth of hiking time and with the likes of Clingman's Dome waiting at 6,625ft then a wee bit of training prior to the off is always advisable. If you'd prefer to experience the natural beauty and stunning mountain views of the Great Smoky Mountains from a slightly more comfortable angle then jumping in a car or RV will no doubt provide plenty of picture perfect moments without having to bust a gut. There are numerous roads to take you past the historic cabins, valley communities and verdant mountain slopes of the Smokies and stopping off en-route to soak up the sights is totally the done thing. Cades Cove, Newfound Gap and Cataloochee are all recommended roads so jump on-board and enjoy the ride. Further reading: Running from Louisiana to South Carolina and incorporating Mississippi, Georgia, Alabama and Tennessee, America’s Deep South states are a hot bed of musical heritage with country, blues, soul and rock & roll all finding their spiritual homes within the region’s hot and steamy southern roots. Read our guide to the music of the Deep South.